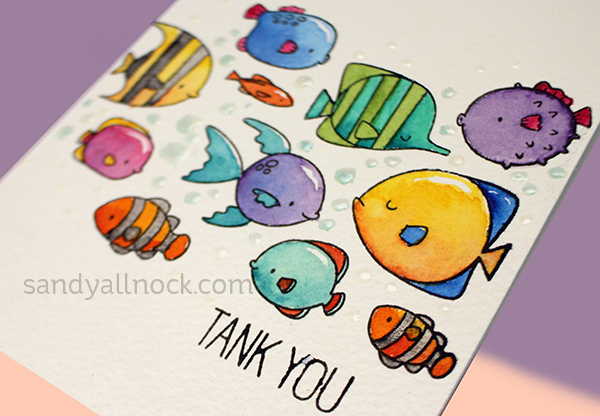 These just might be my favorite little fishie stamps of the season – well, til I see another one, haha! I love their clean simple shapes, and it’s easy to make them look rounded with all their open space. Just love em! Watch the video below or click HERE to see it in HD on YouTube. I painted water as just drops, which gives a color to the otherwise clear drops of Glossy Accents. So this is such a cute card!! I love fish stamps and I love your card and the colors that you used. I’m real bad at picking colors so this will help a lot. Cute card! I do like fish stamps, so I might have to get these! Super CUTE fishy card! Thanks for the video!!!! Beautiful fish. I could watch you color all day long. Thanks for sharing your talent with us. I love these fishies too, and have the stamp set! Gotta say you really rocked it with your watercoloring. Love the vibrant colors you chose. Wow – It’s like you made this tutorial just for me! 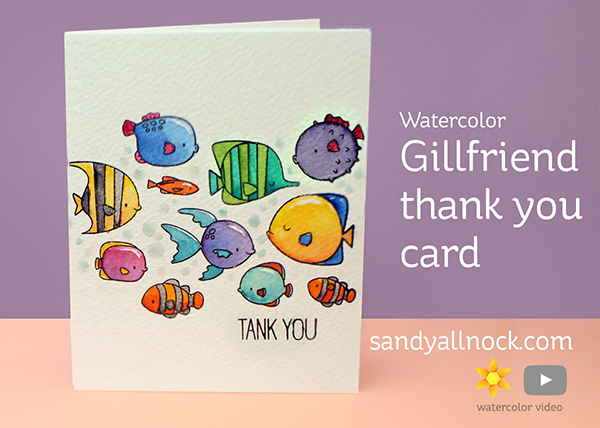 I’ve had the Gill Friends stamp set for a couple of weeks now, because I knew I’d want some new fishies for the Copic Underwater class that was coming up – and I happened to order a new Daniel Smith sample card from Ellen Hutson with my last order – which is on its way now!! I probably have enough on the old sample card to do these little fish tho – so I can get started right away. It’s been so hot and dry here, I’ll be glad to cool off under water, at least mentally! Fun cards, Sandy. Love the happy colours.